FORT MEADE, Md. - An Army private declined to enter a plea Thursday to charges he engineered the biggest leak of classified information in U.S. history. Pfc. 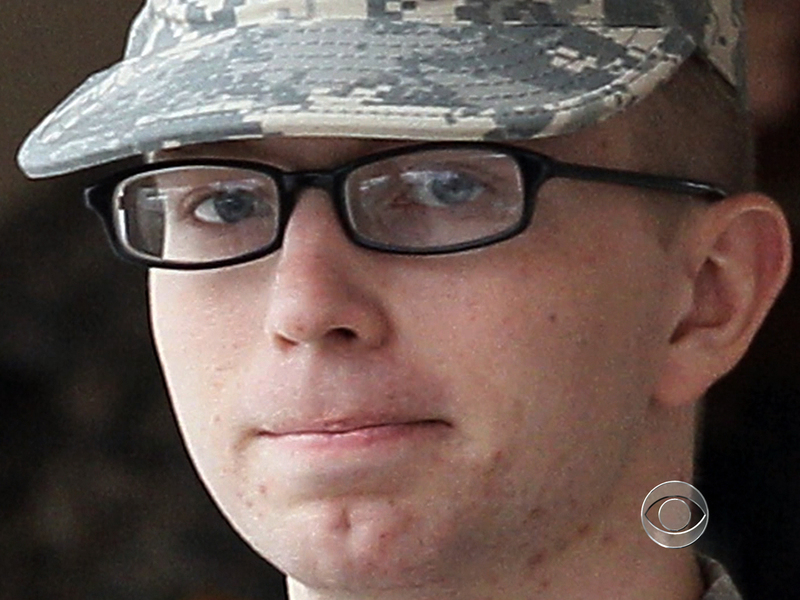 Bradley Manning also deferred a choice of whether to be tried by a military jury or judge alone. Military judge Col. Denise Lind presided over the 50-minute hearing at Fort Meade near Baltimore. She didn't set a trial date but scheduled another court session for March 15-16. Defense attorney David Coombs proposed a trial date sometime in April. He said the government's proposed calendar could push the start of the trial to Aug. 3, a date that Coombs said could jeopardize his client's right to a speedy trial. Manning has been in pretrial confinement since May 2010. He faces 22 counts, including aiding the enemy. That charge carries a maximum penalty of life in prison. The others carry a combined maximum of more than 150 years. The 24-year-old native of Crescent, Okla., allegedly gave the anti-secrecy website more than 700,000 documents and video clips. Defense lawyers say Manning was emotionally troubled and shouldn't have had access to classified material nor have been sent to Iraq for a tour of duty. A court-martial defendant can defer entering a plea until the start of the trial and defer choosing a judge or jury until shortly before the trial date. Doing so could buy the defense more time to investigate the background of prospective jurors or negotiate a deal, said Eugene R. Fidell, a former Coast Guard judge advocate who teaches law at Yale. The hearing  officially the start of Manning's court martial  was more formal than his December preliminary hearing in the same courtroom. The defendant, his military lawyers and the prosecution lawyers all appeared in military dress uniform by agreement, as opposed to the camouflage field uniforms they all wore in December. Manning stood when the judge asked him for his plea, then let Coombs answer that he would not be entering one Thursday. Aside from that, Manning appeared calm as he sat at the defense table, largely motionless and expressionless. He looked directly at the judge when she spoke to him and occasionally at defense and prosecution lawyers as they stood to address the court. Manning spoke only a half-dozen times, answering firmly and clearly, "Yes, your honor," and, "No, your honor," when asked if he understood the proceedings or had any questions. Compared to the full courtroom at Manning's preliminary hearing, Thursday's session drew only about 20 courtroom observers, including a half-dozen journalists and some Manning supporters. Observers were warned before the hearing not to fidget, wear sunglasses or sleep during the hearing  a likely reference to the preliminary hearing, when Manning supporters did all those things in the audience section of wooden court benches. About another dozen journalists watched the proceeding on closed-circuit television in a nearby building. The only outburst was as the judge adjourned the hearing. "Judge, isn't a soldier required to report a war crime?" protester David Eberhardt of Baltimore said loudly. She didn't respond. A 70-year-old member of the anti-war group Code Pink, Eberhardt was referring to Manning's alleged leaking of a video showing the 2007 Apache helicopter attack in Iraq that killed a Reuters news photographer and his driver. The government says it was accidental. The judge, Col. Denise Lind, also presided over the court martial in 2010 of Lt. Col. Terrence Lakin, a doctor who was convicted of refusing to obey orders after refused to deploy to Afghanistan because he questioned whether President Barack Obama was born in the United States. At the a preliminary hearing in December, military prosecutors produced evidence that Manning downloaded and electronically transferred to WikiLeaks nearly half a million sensitive battlefield reports from Iraq and Afghanistan, hundreds of thousands of diplomatic cables, and the video from the Army helicopter, which WikiLeaks dubbed "Collateral Murder." Manning's lawyers countered that others had access to Manning's workplace computers in Iraq. They say he was in emotional turmoil, partly because he was a gay soldier while U.S. armed forces still barred gays from serving openly. The defense also claims Manning's apparent disregard for security rules during stateside training and his increasingly violent outbursts after deployment were red flags that should have prevented him from having access to classified material. They also contend that the material WikiLeaks published did little or no harm to national security. In the December hearing at Fort Meade prosecutors presented excerpts of online chats found on Manning's personal computer that allegedly document collaboration between him and WikiLeaks founder Julian Assange.